Sosai Masutatsu “Mas” Oyama summed up his entire Martial Arts philosophy in his Eleven Motto’s, known as the “Zayū no Mei Jūichi Kajō” 座右の銘十一個条, which are central to his teaching. Many of these hold very practical application even today. The Martial Arts way begins and ends with courtesy. Therefore, be properly and genuinely courteous at all times. Even for the Martial Artist, the place of money cannot be ignored. Yet one should be careful never to become attached to it. 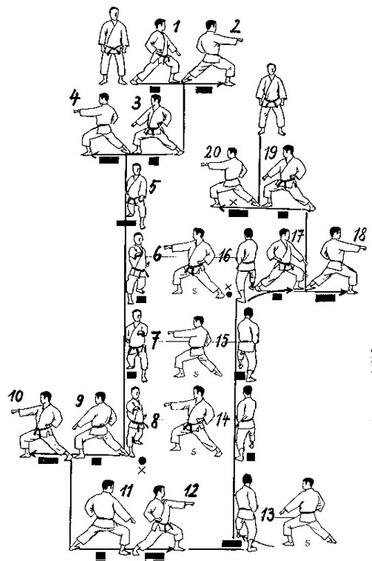 The Martial Way is centred on posture. Strive to maintain correct posture at all times. The Martial Arts begin with a point and end in a circle. Straight lines stem from this principal. The true essence of the Martial Way can only be realized through experience. Knowing this, learn never to fear its demand. Always remember: in the Martial Arts, the rewards of a confident and grateful heart are truly abundant. 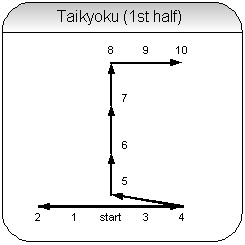 Meanings of Taikyoku is literally translated as “grand ultimate”, and in Chinese, the kanji characters are pronounced Tai Chi. The word Taikyoku can also mean overview or the whole point – seeing the whole rather than focusing on the individual parts, and keeping an open mind or beginner’s mind. The beginner’s mind is what is strived for during training and in life. The beginner’s mind does not hold prejudice and does not cling to a narrow view. The beginner’s mind is open to endless possibilities. As always, begin the Kata in Attention Stance, with feet together, hands at your side and eyes forward. Every Kata begins and ends from this stance with a bow. This kata starts from a open stance after the bow with hands in ready position. 1. LEFT 90 DEGREE COUNTER-CLOCKWISE TURN, DO A LOW BLOCK. 5. LEFT 90 DEGREE COUNTER-CLOCKWISE TURN, DO A LOW BLOCK. 9. 270 DEGREE COUNTER-CLOCKWISE TURN, DO A LOW BLOCK. 10. STEP, DO A MID THRUST. 11. 180 DEGREE CLOCKWISE TURN, DO A LOW BLOCK. 13. LEFT 90 DEGREE CLOCKWISE TURN, DO A LOW BLOCK. 17. 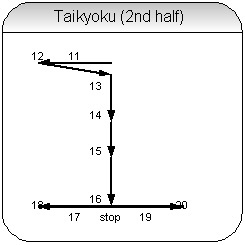 270 DEGREE COUNTER-CLOCKWISE TURN, DO A LOW BLOCK. 19. 180 DEGREE CLOCKWISE TURN, DO A LOW BLOCK. CLOSE. BRING LEFT FOOT BACK AND BOW. Mas Oyama Trained James Bond…Seriously! 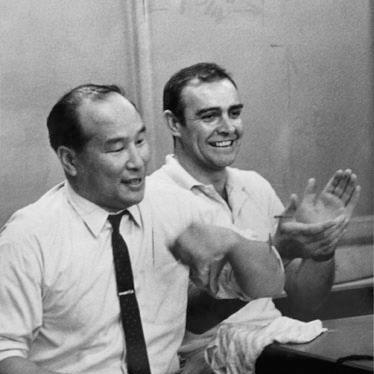 Mas Oyama, founder of Kyokushin “Ultimate Truth” Karate, trained James Bond star Sean Connery. Not only did Mas Oyama train Sean Connery, Sean Connery was granted the rank of Black Belt (honorary Shodan)… Anyone familiar with the militaristic training requirements set by Mas Oyama understands what a momentous accomplishment it was to train with Mas Oyama, so much so that even the Honorary title is impressive. 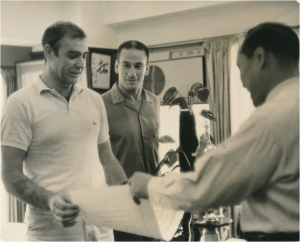 Mas Oyama presenting Sean Connery with Honorary Black Belt Certificate in August 1966. One hundred and twenty-five years ago today, Miyagi Chojun (Mas Oyama) – sensei was born. It is a good time to remember the shoulders we are standing on, and reflect on your karate. His style lives on stronger (though more fractured) then I think he could have imagined. 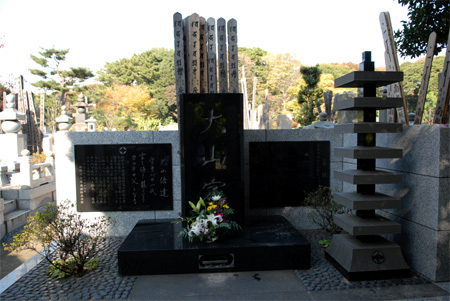 His burial site and memorial in Japan is visited often by practitioners. While I am a Kyokushin practitioner, unlike some I do not revere the man, he was after all just a man. His contribution and accomplishments however I will always hold in high regard. I train in and teach Kyokushin Karate. One of the things that I love about my style is the simplicity of it all. Yes you read correctly. 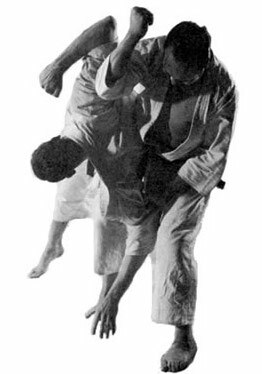 At its core Kyokushin training consists of three main elements: (1) technique, (2) forms, and (3) sparring. These are sometimes referred to as the three “K’s” after the Japanese words for them: kihon (technique), kata (forms), and kumite (sparring). Technique is everything in Karate. Some may disagree with that but without technique you can not gain perfection. Masutatsu Oyama, once said that after 1,000 repetitions one could say that one could perform a given technique. Only after 10,000 repetitions could one say that one had mastered it. Some students may think that they master certain move more quickly however the premise is correct. To many student rush their training, like a race to the black belt, of course they could not rush their training if they did not have a willing Sensei. Part of the mastery of technique in the martial arts is a mastery of self, which leads to perfection of form. If someone tells you they attained their black belt in 2 years (730 days) or 3 years (1095 days) ask how often they trained. Kata is the synergy or technique and skill. Performed correctly the student will visualize his/her opponents for each move and execute each step with the appropriate power, speed and focus. Masutatsu Oyama was slightly more generous with forms; saying that after 1,000 repetitions one could say that one had mastered a given form. Since Kata is technique in motion and if we focus on technique first this statement makes sense. I equate Kata to dance or moving meditation, like either the movements must be fluid and natural, which can only be accomplished with a quiet mind. When we first begin to learn a Kata we must think to learn the succession of movements but with continued practice the moves should become instinctive, second nature. Only then can the Kata begin to flow as an expression perfect technique in motion. Many discount Kata because they don’t see the immediate benefit of performing Kata, yet those with patience learn from Kata, clarity of mind, new applications of old techniques, and gain muscle memory for most situations. Kata is the core of training the Martial Arts mind and sense. Kumite or Sparring is the goal for some students and the bane of others. Regardless of your motivation for practicing the Martial Arts sparring is critical to maturing your skills. Some students and instructors believe in full-contact sparring from the beginning, if you are in the Military or live in DC then I would agree, but for most students this can lead to very bad habits and flinching. Like training in Kihon and Kata training that progresses is better. I prefer to start students sparring with defined rules, including light contact, defend only, hands only, or feet only. In this way students are provided a safe environment where familiarity and trust is built with themselves and their fellow students. Trust is important. Most students have day jobs or classes and are ill served with facial bruises or broken bones. Control of one self means having the ability to inflict equally a light strike or rib crushing blow. While students need to understand what it feels like to get hit and how to take a hit, they need to be ready for it both physically and mentally. Sparring should be frequent and fun. These are my thoughts and experience with the 3 Ks, be flexible and adaptable in your training for tunnel vision is something you want in your opponent not yourself.